Hometown: Bridgewater, New Jersey, U.S.
Died: March 30, 2010 in Operation Enduring Freedom. The mother of a Bridgewater-Raritan High School graduate who died while serving in Afghanistan Monday remembered her son as a loving person who cared deeply for his family and his soldiers.Scott Brunkhorst could have left the Army in August, when his five-year commitment ended. Instead, the Bridgewater-Raritan High School graduate re-enlisted, a decision that ultimately cost him his life. Brunkhorst, 25, a weapon squadron leader and father of a young daughter, was killed in action in Afghanistan Monday while serving his second tour of duty, his mother, Linda Brunkhorst, said Friday. "He just loved everybody," she said at her home in North Carolina today. "If you had no money and he needed a shirt he’d give you the one off his back." Brunkhorst comes from a military family. 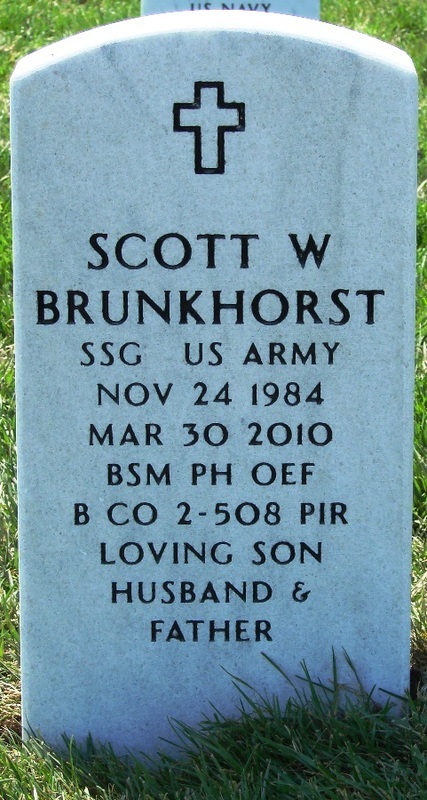 Linda Brunkhorst, her husband and Scott's grandfather Richard served, as well as his brother. "He really was a patriot," said Jim Morgan, a high school friend from Branchburg. "He was a proud soldier. He died fighting for his country and protecting all of us so we don’t have to cower our heads in the face of terrorism." The Department of Defense has not released details of Brunkhorst’s death, but two friends who said they have spoken with his widow said Brunkhorst was killed when he stepped on an improvised explosive device as he got out of his truck. Brunkhorst is at least the 15th service member with ties to New Jersey to die in Afghanistan since the war began in 2001. Nearly 100 others have died in Iraq since 2003. Morgan said Brunkhorst’s wife, Krystal, left him a message during the week, saying she needed to speak with him immediately. "At that point I knew just from the tone of the message," Morgan said. "It’s just crazy." Brunkhorst, whose unit was based out of Fort Bragg, N.C., joined the military in 2003, soon after he graduated from Bridgewater-Raritan High School. Born in Colorado, then brought to Fayetteville, N.C. as an infant, Brunkhorst moved to Bridgewater shortly before entering high school, where he played football and ran track. He then joined the military. Friends said he was dedicated to serving his country, so when his five-year commitment with the Army ended last year, he re-enlisted. Yesterday, they remembered him as a selfless, fun-loving man and a loving father and husband. "He always put us before himself, always. That was just him," said Brett Colavito of Branchburg, another high school friend. "He was like a brother to me and like a second son to my family. The whole time he was in the military, any time he’d get off duty he’d come up and see me." As a squadron leader, he felt a special camaraderie with the soldiers he commanded, Linda Brunkhorst said. "The first time he went, his newbies were having so much trouble he was hauling their packs around for them," she said. "He was like their dad you know? Every problem everybody had he would be there to help. His soldiers were very important to him. He loved his wife he loved his family but his soldiers were very important to him." Another friend, Chris Snook of Martinsville, said he saw Brunkhorst last summer before the soldier departed for Afghanistan. "He was just a happy, happy guy. He loved his country. He loved his family," Snook said. "He was proud of what he did. He didn’t really get into detail about (his military service,) but he was definitely very proud." Snook recalled with a smile a weekend two years ago when he and Colavito drove to the U.S. Military Academy at West Point where Brunkhorst was stationed at the time, picked him up, then drove back to Seaside Heights. "I remember rolling up right into the middle of the military base blaring music and there he was with his bags all ready to go," Snook said. "We drove like five hours all the way back down to the shore. It was just like we were in high school again. It was one of the best weekends of my life." Morgan said Brunkhorst never forgot anyone who made an impact on his life. "If he had an idea and he wanted to do something, he just did it. He was determined, so once he realized he wanted to go into the military he just went," Morgan said. "But he still came around and was always true to his friends." "It’s been a tough couple of days, but he’s a hero." In addition to his wife, mother and daughter, Kendall, Brunkhorst is also survived by his father Richard, brothers Adam and Richard, and a sister, Danyella. His brother Adam, a U.S. Army sergeant, is stationed in Germany, serving his second tour of duty.